Summary: With the Smart Crunch you get an incredible ab and back workout that takes just 4 minutes a day! The Smart Crunch is a revolutionary abdominal machine that tones and tightens your abs while building core strength. The Smart Crunch motion concentrates on the upper and lower abs, and the innovative cross-crunching action focuses on the obliques. These two movements provide a complete and effective abdominal workout. The Smart Crunch is the most effective ab workout ever developed. It has revolutionized the way we do crunches. 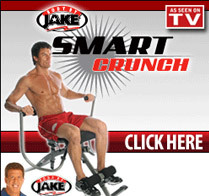 It has superior back support and you're in a comfortable seated position during the entire Smart Crunch workout. No matter what your fitness level, you can get results from the Smart Crunch. The Smart Crunch is whisper quiet. You can even do it while you're watching TV! Plus, it folds down and rolls away for easy storage.